Comarch takes part in Thailand Wealth Management Forum! We’re thrilled to sponsor and participate in Thailand Wealth Management Forum! The conference takes place on the 17th of May in Bangkok. Thailand Wealth Management Forum is the annual event. It brings together C-suite, senior management and key-decision makers in leading companies across Private Banking, Retail Banking, Asset Management, Independent Wealth Management and other communities. The event is hosted by Hubbis in Conrad Bangkok hotel. 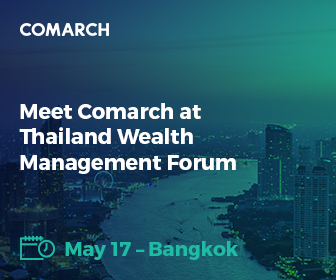 It’s not the first time Comarch joins Thailand Wealth Management Forum. Our delegates were present at the last year’s edition. Speakers delivered the presentation on trends in private and affluent banking. This year’s edition of the conference focuses on managing expectations of high-net-worth (HNW) and ultra high-net-worth (UHNW) clients. Besides, world-class experts will present their most successful case studies and best practices. Last but not least, Thailand Wealth Management Forum is a great opportunity to exchange experiences and discuss innovations that are most likely to transform the financial industry in the nearest future. The detailed agenda is available on Hubbis website. Krzysztof Maurer - Managing Director at Comarch Thailand is one of the conference speakers. Do not miss his presentation entitled ‘Do we need AI in wealth management?’, at 9:55 AM. What is more, we kindly invite you to join Comarch’s workshop in Room B, at 2:30 PM. Anna Sacha and Grzegorz Prosowicz will lead the workshop devoted to both user experience and wealth management. The subject of it, ‘What is true UX in wealth management all about – employee and customer perspective’, will surely give you more insight into the leading industry trend. Get to know us better! We invite you to visit our stand. Comarch delegates - Krzysztof Maurer, Anna Sacha, Greg Prosowicz, Parida Leelaniramol will answer any questions you may have.